Andy's Forum > Categories > ALTERNATIVE HEALTH > Raw organic fruits and vegetables can cure cancer, so why don't oncologists tell their patients? 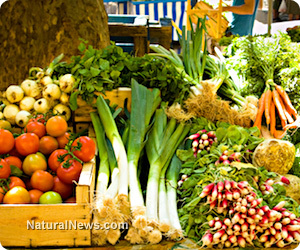 Raw organic fruits and vegetables can cure cancer, so why don't oncologists tell their patients? There is a 75-year "CON" known as Western Medicine, but it's a hush-hush topic in the news and in newspapers and magazines. Although medical doctors and surgeons are experts at fixing broken bones or removing animal fat from clogged arteries, the "pharmaceutical nation" known as the USA is caving in on itself, but nobody is allowed to talk about it on TV, or they lose all their sponsors. There is also a world of medicine known as organic food, but some people want to cook it, fry it, boil it or broil it, or even worse, grill it out, and that LIVE food becomes DEAD food, useless to the body, which needs nutrients for immunity, cellular health, vitality and sustainability. Is there a "CANCER INDUSTRIAL COMPLEX" in the USA? The answer to every one of the questions above is to just listen to the people who DO KNOW about RAW foods and can tell wonderful stories of their own recovery from deadly cancer and why they chose nutrition over chemo, surgery and radiation. Learn from honest souls who share their most personal journeys, through and past the "cons" of the cancer-industrial complex. Consider the fact that even scientists have found a natural cure for cancer, and people TESTIFY in court that it works, even for children with "terminal" cancer: (http://www.burzynskiclinic.com). Natural News has a few other heart-warming stories about real people who survived "lethal" cancer and lived to share their stories with the world: Jay Kordich, known as the "father of vegetable juicing," says raw foods are responsible for overcoming his own bladder cancer. One of his followers, John Kohler, has been on a raw food diet since 1995, primarily enjoying juices. Not only did he survive his spinal meningitis, but he also lost weight and is living life more healthfully than ever. Check out great RAW FOOD regimens: (http://www.naturalnews.com). One-and-a-half million people every year fight cancer and need to know about RAW foods, and we could end this "search for the cure" that the masses are CONNED into believing is worthwhile. The cure is here! The cure lives in nutrition. Appreciate the fact that... if you don't "eat" cancer, it doesn't "eat" you.